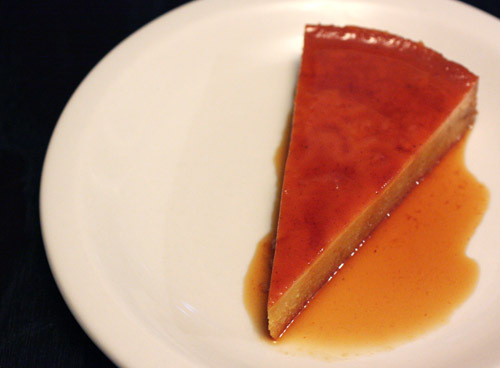 For this pumpkin almond flan, I pulled a book from the shelf that’s from an Austin favorite. Fonda San Miguel has been serving excellent, interior Mexican cuisine since 1975, and I’m fortunate to live just a few blocks away. The restaurant is located in a hacienda-style building that has been remodeled with huge hand-carved wood doors from Guanajuato, Mexican tile, gorgeous punched tin lanterns, and rustic leather equipales. The owners are also art collectors, and their many displayed paintings by renowned Mexican artists are rotated throughout the year. In 2005, they created a book, Fonda San Miguel Thirty Years of Food and Art , containing many of the dishes served and photos of much of the artwork. As stated in the book, the goal of Fonda San Miguel is to present intriguing Mexico at its best through the food, art, and decor. In my opinion, they serve the best Mexican food anywhere, and the only other restaurant I’ve visited that is on par is Rick Bayless’ Frontera in Chicago. The sopa de elote with poblanos (corn soup) is a dish I’ve enjoyed in the restaurant and made from the book, and it’s fantastic. Their ceviche is always outstanding, and the freshly made salsas, tortillas, and margaritas are several notches above standard tex-mex fare. At the restaurant, the Sunday brunch includes four large tables with salads, warm vegetable and egg dishes, roasted chicken and pork made with a couple of different sauces each, and a dessert table. For dessert, there’s always a flan or two, along with several other tempting items, but it disappears fast. The version in the book is almond flan, and I chose to add pumpkin. To begin, sugar is caramelized in the baking pan, and letting it reach a dark amber color results in a rich, complex flavor in the end. 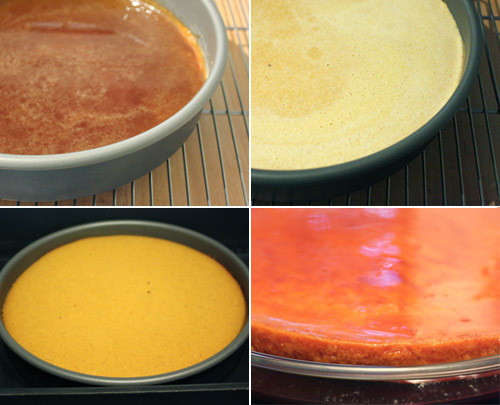 The caramel is set aside while the flan base is mixed in a blender. Sweetened condensed milk, eggs, slivered almonds, vanilla, and milk were pureed together. To this, I added about a cup of roasted pumpkin puree with some cinnamon, cayenne, and ancho powder. The blended mixture was poured over the cooled caramel, and the pan was baked in a water bath. Couldn’t have been simpler. One common criticism of flan is that it can be too eggy. In this case, the almond, pumpkin, and spices provided such a flavor boost that the egginess of the custard was not the focus. 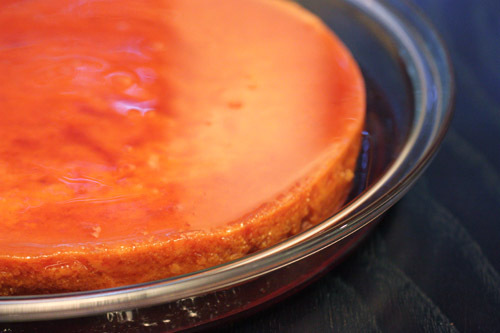 The finished, chilled flan popped right out of the pan, and the caramel was poured over top. It was off the charts delicious. Spiced pumpkin, ground almonds, and vanilla together in the smooth, creamy custard with that dark, lovely caramel pooling about it made one fine dessert. In fact, it was a lick the plate kind of dessert. For anyone visiting Austin, the restaurant should definitely be on your list, and the experience of the place is beautifully presented in the book. This slice directly to my mouth! MMMMM, this spring I was visiting family in NYC and was fortuante enough to try a Cuban restaurant that was to die for good. 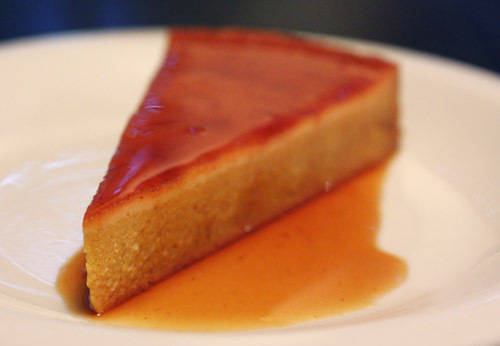 Well, for dessert I had Pumpkin Flan, talk about delish! Yours looks wonderful and just as good! If you're ever in NYC the restaurant is called Boca China! That flan looks extremely good! A delightful treat! I'm very impressed by this flan! I'm told flan isn't easy to make. I like the fall flavors here too. Wow - this looks completely awesome! pumpkin almond - not a combination i would think of off the top of my head but it sounds, and looks, delicious! nice job. Thanks everyone! Flan is actually incredibly easy to make. The almond flavor is somewhat mild since slivered (blanched and peeled) almonds are used. It goes great with the pumpkin, but pecan would be another good match. For pecans, I would pre-pulse those in a food processor so the blended mixture becomes very smooth. i love flan. it's one of my most favorite desserts ever. this one is bookmarked.